Puerto Rico is not just dealing with an economic crisis. In a trend that is both a consequence of and contributor to its financial woes, the island’s population is also declining at a clip not seen in more than 60 years. 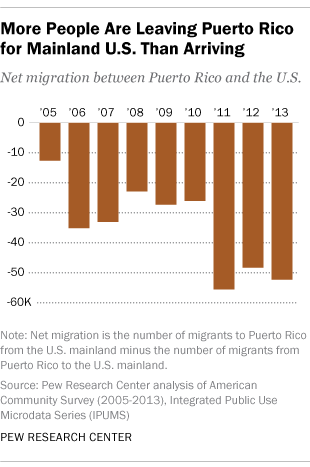 It’s not a new problem: Puerto Rico’s population began declining in 2006 and has continued every year through 2013, while the population of Puerto Ricans on the U.S. mainland has grown, according to a Pew Research Center analysis of Census Bureau data. But the island’s population decline has accelerated in recent years. 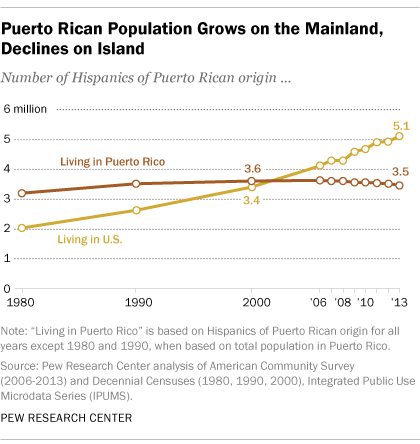 Over a two-year period between 2011 and 2013, Puerto Rico’s net population decreased by 50,000 people annually. Job-related reasons were cited by 42% of those leaving. According to a new report commissioned by the Puerto Rican government, not only has the island’s population decline been a drag on its economy, but it will hinder the commonwealth’s ability to recover. If people can’t find jobs at home, they move elsewhere in search of work. And fewer workers means less productive capacity and lower consumer demand down the road. The population decline has included young people. Enrollment in Puerto Rico’s elementary schools and high schools has declined 40% over the past decade, the report said. The island’s economy, as measured by real gross national product, has declined in tandem with its population. It shrank in seven of the past eight years, and is now 13% smaller than it was in fiscal 2006, according to data from the Government Development Bank. In terms of population, the downward trend looks like it won’t be turning around anytime soon. The latest projections from the U.S. Census Bureau show the island’s population will continue to shrink, from 3.6 million today down to 3 million in 2050. Another driver of the island’s population loss is falling fertility. In 2013, the average woman in Puerto Rico was estimated to have 1.3 children during her lifetime, a measure called the total fertility rate. A decade ago, the fertility rate was 1.9. Historically, fertility has dropped during economic recessions. By comparison, women born in Puerto Rico who move to the U.S. mainland have more babies than those who stay on the island. In 2013, the average total fertility rate was 2.1 for Puerto Rican-born women living in the U.S.